A driver responsible for smashing a Ford Focus car through a fence and colliding with a house was under the influence of drugs, Jedburgh Sheriff Court has been told. Tristan McCuaig, 34, of Drumlanrig Square, Hawick, was disqualified from the road for 18 months and fined £250 after admitting driving while under the influence of drugs. 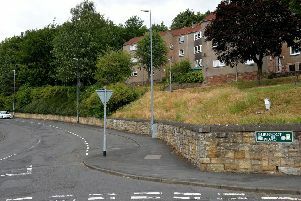 That offence was committed in Ramsay Road, Hawick, on January 31. The court heard that a neighbour heard a loud bang at around 11.15pm and felt the building shake. When he looked out, he saw McCuaig get out of a dark-coloured car, saying that everything was sorted and that he would pay for the damage. However, depute fiscal Tessa Bradley said McCuaig appeared incoherent and walked away from the scene and police were then called. She said that the vehicle had gone through an iron fence and caused some masonry damage to the house. Police officers launched a search for the father of two, a scaffolder by trade, and eventually he reappeared at the scene of the crash. He confirmed he was the driver of the car at the time, and officers noted that he appeared drowsy and had dilated pupils. McCuaig gave a sample of breath for alcohol and it was negative but he failed an impairment test “fairly spectacularly”. Ms Bradley said that McCuaig needed assistance when he was walking “such was his state of impairment”. He then gave a blood sample revealing traces of drugs. Defence lawyer Stephanie Clinkscale said her client had been going through a difficult patch with his wife and had taken drugs before getting into the car. She added that his employer was aware he was going to lose his licence. Sheriff Peter Paterson said the level of McCuaig’s impairment was significant. He reduced the length of his ban from 21 months to 18 due to his guilty plea, however.